Blondie and Brownie: Broadway Panhandler Sale! Broadway Panhandler Sale! Broadway Panhandler Sale! Broadway Panhandler Sale! Every good New Yorker knows that New York is full of sales. And there's one I always miss: the Broadway Panhandler Sale! I got word yesterday that it is happening RIGHT NOW! And Saturday is the best day to stop by just don't forget your knives at home! We don't talk much about our equipment in the kitchen, but one thing Brownie, Lawman, and I can agree on is everyone should have a good knife that feels like an extension of your arm and is sharp enough to handle anything. And getting them sharpened is a must! 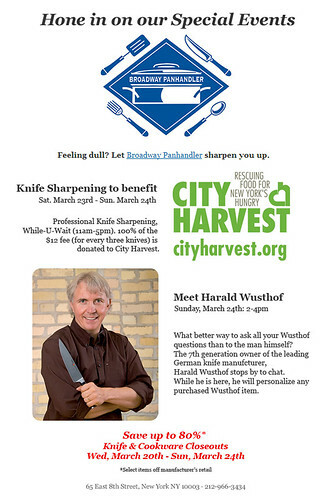 Take yours in on Saturday, shop for some fun kitchen things, donate to charity, and meet Harald Wusthof. There are worse ways to spend your Saturday afternoon. I have been meaning to get my knives sharpened for probably the past year. This sounds like a great opportunity to go ahead and actually do it. This is exactly why I wanted to get the word out! Sharpening your knives is always one of those "next weekend" tasks. 8 knives. $36. picked up the same day.